Human Resources industry has evolved greatly when it comes to technology and trends. The role of HR has been transformed from merely managing employee data to a strategic partner in business decision making. This transformation has brought a set of new challenges and solutions for the industry leaders and technology innovators. 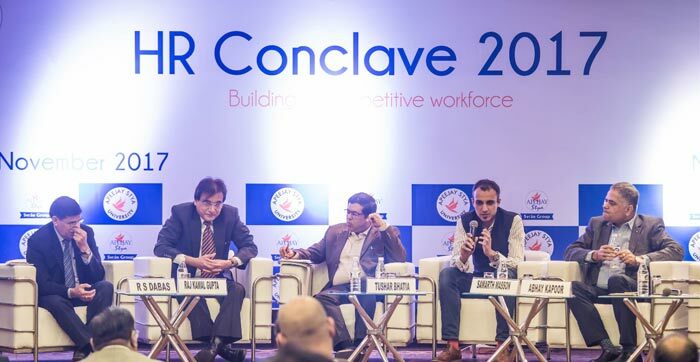 Each year, HR Conclave gives a platform to discuss issues pertaining to Human Resources and Performance Management, and put forward their opinions and share experiences to figure out solutions. 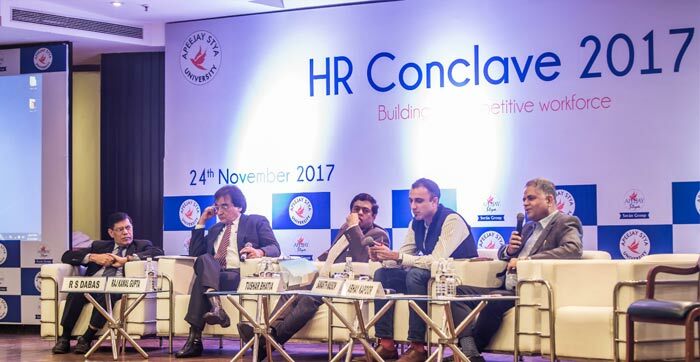 This year, HR Conclave 2017 was held on Friday, November 24, 2017 in New Delhi, India to express thoughts and exchange experiences and knowledge about the rapidly changing trends in Human Resources industry. Apeejay Stya University, in association with Apeejay Stya & Svran Group organized the event at the India International Centre, New Delhi where Tushar Bhatia, CEO-founder Empxtrack Inc. (a global cloud-based HR and Performance Management solution provider) headed the first session as a moderator. The theme for the first session was “How to select a Performance Management System”? 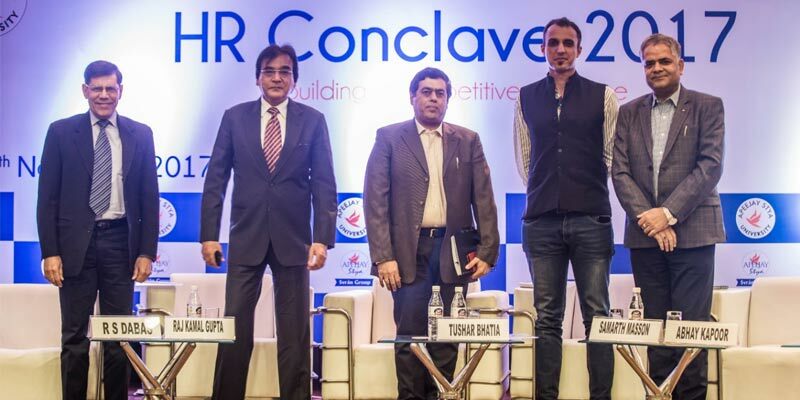 The other speakers who participated in the event were: R S Dabas, an International Trainer, Leadership Coach & HR Adviser-Public Speaker; Raj Kamal Gupta, Director HR at FMCG Major; Abhay Kapoor, HR Leader at Amazon (India Operations – North); and Samarth Masson, Founder at Dockabl, a Talent Management Agency. 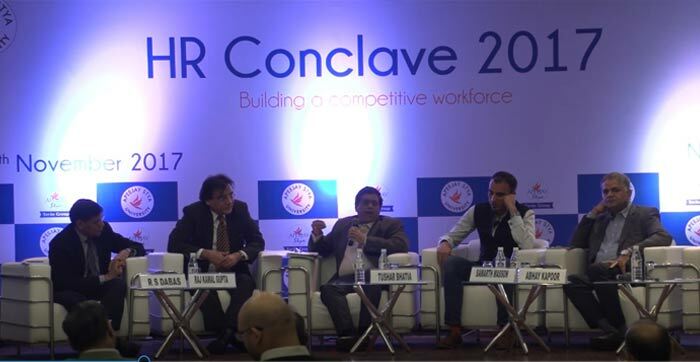 HR Conclave brought together different experts to discuss the kind of performance management approach that exists in their organizations. Read on the conversation or Watch the video to get some practical insights & trends described by these experts. This is the first part of a blog series focusing on Performance Management. To get notified when the next post appears, Subscribe to our blog. Question: What is the Performance Management System in your organization and what should an ideal Performance Management System be like? He mentioned that the practice that is prevalent today is PMS and not just appraisal. But if PMS is not serving the purpose, appraisal rating can be damaging. R S Dabas talked about how performance management is really contributing. He mentioned about his organization being 2800 crore in 2009 and they had a vision of 20,000 crore by 2018. The organization evolved a concept called “Tayyari Udaan ki”. The concept was developed to involve 30,000 employees of the company in Tayyari Udaan ki and PMS was used for this purpose. This new concept not only changed the organizational culture, but it also brought clarity to the company. Now monthly reviews are conducted with measurable parameters. This brings clarity, as it is a future evolving action plan. He further added that every month they had review on what is achievable and what’s targeted. The projects taken by employees were directly linked with their performance evaluation process. Through this approach, the company has seen a significant growth in terms of employee productivity and revenue. And the company continues to have larger goals. So today, it’s not about rating, it is an evolving action plan. Linking with the vision, linking with goal and growth of the organization. Question: What is the current context of coaching today and how do you perceive it is going to be in next 20 years? He mentioned that Performance Management System is not something that a company can buy off the shelf. There are no standardized packages. It has to be highly customized. In a particular organization, it could be an extremely dynamic process. The performance management scheme, which might be used effectively today, may not in use tomorrow or the next year. He further added that a group of companies like Satya, has different business verticals. Each one of them needs a manpower with unique skillset, experience and different academic background. In addition to performance measurement, there has to be weightage to discriminate and identify top performers Thus, the need to customize Performance Management system comes in. Training, mentoring and development is a very important aspect. An ideal performance management system should have an inbuilt mechanism to identify training needs of an individual, and continuously track employee performance. The evaluation process should not only be conducted to reward employees but also identify areas of concern and excellence. It is an intricate exercise. A lot of input goes from the management and a lot of patience is required on behalf of employees whose performance is measured. Once the performance gaps are determined, HR team and the managers can implement a corrective action plan to mentor and train employees. He said that training needs for each individual differs. It might be different for a supervisor, worker or manager. At a managerial level, the employer looks for leadership skills, listening ability, communication skills, and a positive approach to receive and provide feedback. All those skills need to be balanced. So, a PMS has to be customized. Only then it will become effective. Abhay talked about managing employee performance being the core job. He said that managing employee performance is important, otherwise coaching and mentoring do not make sense. Performance of an individual can be influenced by mentoring, training and skill development. He further added that Performance Management is a holistic approach which drives a business in the organization. In a performance management lifecycle, one can identify people who can be given additional job responsibility and promoted. If an organization fails in implementing a right kind of PMS in the organization, its gone for a toss. The kind of PMS a company should have, entirely depends on the maturity of the processes of an organization. Some organizations still use bell curve, as it is relevant for them. But organization that are willing to become mature, must think of doing away with the bell curve. Matured leader in the organization must differentiate between non-performers and top performers easily. They may not need a bell curve kind of a ranking in the organization, and they should be mature enough to reward and punish people and workout on their career graph and provide growth in the organization. There is no readymade PMS available. It needs to be customized according to needs, goals and vision of the organization. Tushar was taken by surprise. It was difficult for him to understand that a company which was completely focused on performance management, has issues in managing basic transactional processes of the company. He realized that the company’s goals and HR needs were not aligned. It took him less time to realize that each organization needs customized PMS because each organization in different industries, verticals, and geographies deals with unique challenges. The maturity of the organization and the path they are on determines the individual process for them. In some cases, bell curve may be relevant while in others rating may not be required. Some companies may want to use 360 feedback while others may not. So, there are various aspects of performance management, a measurement, a setting of goals, a reward and recognition, a risk mitigation strategy, a training strategy and they all combined together to give a PMS. So, when we talk about appraisal, it’s just one part in the entire PMS approach. Do you see succession planning as an ultimate aim of which performance appraisal preceded by KPIs and KRAs are the foundation? He explained succession planning as an essential process to prepare next line of leaders to take roles of the future. He believes that Performance Management has a critical input into succession planning. An ideal approach to succession planning is that when an employer can map out the role expectations for the next level for a particular person. He gave an example, there are three ways in which a person can be promoted to the next role. First level is, from a performance perspective which is about KRAs and KPIs. Can the person deliver the expectations on the next role? Second, is the selected person behaviourally ready to take responsibilities? Third aspect is, does the person has competence and capability to be operating for that role? He said that a PMS needs to be multi-dimensional where it is able to assess readiness for the next role where all these three parameters meet. Unfortunately, most of the practices have been focused on rating. According to Samarth, a well-designed PMS philosophy would actually run on multiple checks of readiness through the entire year on objectives, skills, competencies and overall competence. And through this aggregated analysis, an organization get insights on who is ready for the next role and who still needs more time. That’s how succession planning links to a really good PMS. A graduate in Computer Science and Applications, Sonika is currently contributing to Empxtrack as a Technical Writer. She writes about cloud services, HR practices and rapidly evolving technology. She is an avid reader, and aims to explore and experience life through her work.